In the eighteenth issue of the Bed and Breakfast Traveller, we take you to Port Hope, Ontario, a town rich in history and brimming with hospitality. Port Hope, located one hour east of Toronto, is a small town (pop. 12,500) rich in heritage and character. Situated where the Ganaraska River meets Lake Ontario, you’ll find some of the best freshwater salmon and trout fishing in the world. Our historically designated main street district is said to be the best preserved 19th Century Victorian streetscape in Ontario. Browse through some of the finest Antique and Specialty shops found anywhere. Walking tours through the town highlight many of the over 150 A.C.O. (Architectural Conservancy of Ontario) protected homes and buildings. 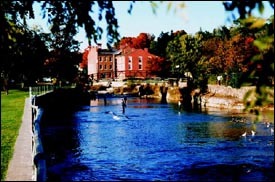 Discover all there is to Port Hope by visiting the towns website at www.town.porthope.on.ca. Port Hope is located in Northumberland County where you’ll find lots to see and do. Check out their website at www.northumberlandtourism.com. www.appleroute.com celebrates a special region of Ontario. This area has enjoyed a rich agricultural history, and you’ll delight in the fabulous scenery, and many interesting towns that make up this route. The Capital Theatre at www.capitoltheatre.com is Canada’s only operational atmospheric theatre. Fully restored to its original 1930’s splendor, the Capital features professional theatre, live performances such as Michael Burgess and Second City, as well as first rate films. Check out the Vintage Film Festival running from October 26th to the 28th, 2001. The Port Hope Bed and Breakfast Association is very involved in promoting Port Hope as a vacation and tourist destination. Our upcoming Christmas House Tour, Saturday November 24th, 2001, features six of Historic Port Hope’s fine B&B’s, each decorated for the season in their own unique style. For tickets and information, visit www.englishtowneinn.homestead.com/Tour.html or phone toll-free 1-866-815-4519. Also check out our association page on BBCanada.com for a full list of accommodations. If Gaming is your pleasure, Kawartha Downs Racetrack and Slots is only a short 20 minute drive from Port Hope. They offer year round slots as well as seasonal harness racing and stock cars. www.kawarthadowns.com. Saturday, November 24th, 2001: Port Hope Bed and Breakfast Association Christmas House Tour. Please see above for information. November 29th- December 9th, 2001: A Capital Christmas. Visit the Capital Theatre while it is decorated with thousands of Christmas lights for a Festival of Trees. Contact the theatre at 1-800-434-5092. November 30th - January 2nd, 2002: Beginning with the Candlelight Walk (Nov.30th), sponsored by the local Kinette Club, carolers parade down the main street to Memorial Park for a lighting ceremony, where thousands of lights adorn trees in a Victorian Village setting. Contact the Kinettes at 905-885-4348 or the Tourism office at 1-888-PORTHOPE. Saturday, December 1st, 2001: Annual Santa Claus Parade marches down the main street to the Memorial Park. Begins at 1pm. Sunday, December 9th, 2001: Port Hope United Church and the Friends of Music presents Handel’s Messiah. For Tickets and information contact the Capital Theatre. Mid-February to April 15th, 2002: Maple Syrup Tours at Dan Thomey Farms, Ganaraska Sugar Camp. Located at County Road #28 and Dale Road, tours run daily from 10am to 5pm (weather permitting). Call Dan at 905-885-9844. June:: Local museums, Dorothy’s House (905-797-2625), and the Canadian Firefighter’s Museum (905-885-8985) open for the season. July 1st, 2002: Canada Day Festivities kick of the summer with a Calithumpian Parade, live Entertainment, and fireworks. Sponsored by the Kinsmen Club of Port Hope. Summer: Visitors enjoy antiquing, shopping, theatre, golf, fishing, hiking, many arts festivals and garden tours. Visit the Town website for full information. September 13th-15th, 2002: The Port Hope and District Agricultural Society, 171st annual Fall Fair. Midway, livestock, exhibits and entertainment are all featured at one of the largest agricultural exhibitions in the area. Call John Goheen at 905-885-8261. 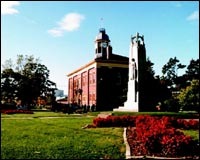 October 2002: Port Hope A.C.O. Annual House Tour. 2002 date not yet set.